Tip change tool for the ZHN. The tip can be unscrewed from the measuring head together with an adapter. The tip is sitting well protected in the tool of aluminium (left). Afterwards it is turned together with the adapter by 180 ° in the tool (center) und unscrewed from the adapter with a normal screw wrench (right). In the same way a new tip is installed. Finally the new tip together with the adapter is screwed in the measuring head (below). For that purpose no additional protection of the head is necessary because the spring system in the head is stiff enough to resist the finger force. For an experienced user a tip change is done in less than three minutes. Afterwards the distance calibration indenter - camera can also be done in less than three minutes with an automatic software routine. 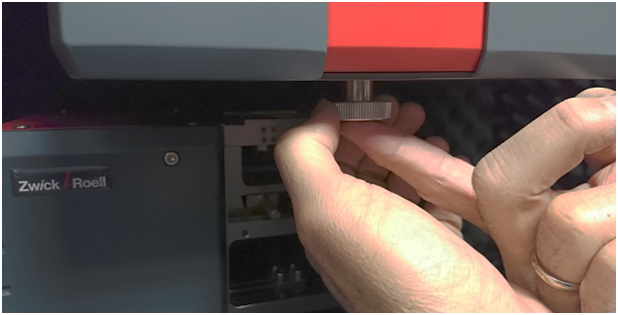 It is not unusual for a ZHN user to change the tip five times daily to carry out different test methods.